Mac systems administrators may find a need to convert an existing regular user account into an administrator account on a Mac. While most Mac users would be best served by converting account status to admin through the Users & Groups preference panel, advanced users can perform the same function through the Terminal by using the Directory Service command line utility dscl. Note this change will have no impact on the ability for any user account, admin or standard, to access the sudo function, or use the root account, both of which are entirely separate from an administrator account in Mac OS X.
You’ll need the regular user accounts short user name to switch it to an administrator account, the rest is handled at the command line. If you aren’t certain of the short user name for the target account, you can use this to list accounts on the Mac, or take a look in the /Users/ directory. Upon executing the proper command, the targeted user account will now have administrator privileges and all access abilities that go with an admin account. This can be particularly helpful for remote administration with ssh and automated setup situations, but it’s also handy in that you can switch a user account to administrator privilege from Single User Mode and when booted from Recovery Mode as well. “osxdaily paul adminaccount” or similar, depending on the account(s) which belong to the admin group. 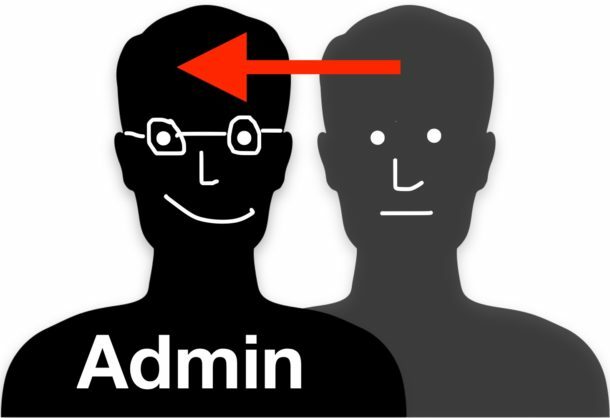 The list will only include administrator accounts, whereas other commands will list all user accounts on a Mac. My own user account has admin priviliges. Long ago I devined a special “admin” account to avoid having to type in the password after “wakening up” in my own account. It seems now that that is only necessary when starting the computer or changing users, so I want to delete that special account (part of cleaning up things), but I cannot delete that status or account, not in my own (admin) account nor in that “admin” account. I wonder is there a way? Yes, you can change the admin account to a standard account. You should also be able to delete the user from the admin group by entering. also keep in mind these commands have to be run with Sudo unless your logged in as the root user. Hi my only account is an standard account, I don’t have a user name for the administrator user, I can’t log in anymore or make changes that require administrator permission. I’ve tried this but it doesn’t work, do you know what I can do? I have the same issue!!!!! did you fix it? Make sure also you input the right commands with their proper cases because it is case sensitive. Hope it will works with yours too. This was really really helpful – finally after hours of struggling my standard user is now elevated to Admin. The extra admin account created by using your procedure can then easily be deleted by clicking – if desired. The only account in my Mac is a standart user. The root account is the Admin. When ı try this commands ı get dscl_cmd> DS Error: -14120 (eDSPermissionError). I don’t have the root password and ı can’t use sudo command please help .